James Gray could return to Wrexham's match squad for Wednesday's home National League game against Guiseley. The striker, 23, had surgery on a broken hand he suffered in the 0-0 draw against Grimsby Town on 22 September. Wrexham failed to win any of the four games Gray has missed, but the former Accrington Stanley player will have his cast removed on Wednesday. 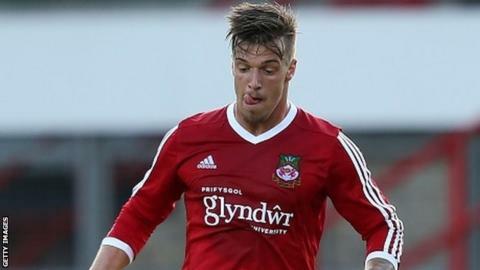 "He might be involved in the 16 on Wednesday night," Wrexham manager Gary Mills said. Wrexham slipped to 10th in the National League following Saturday's 2-1 defeat at Dover Athletic. Mills' side are without a win in five games, but the manager remains upbeat ahead of the visit of 18th-placed Guiseley. "Let's stop feeling sorry for ourselves," Mills said. "We're disappointed we haven't won any matches in the last few games but let's go and do something about it on Wednesday."